We can take your design, it can be a Photoshop PSD file or any other media format, and make a fully operational WordPress theme out of it. You will get a complete and ready to use wordpress theme that will exactly match your design. Your new theme will be hand coded with the highest standards available today. Already got your design coded in xhtml? We can take your code and make it smoothly work with WordPress. This service could be very useful to you if you already have a website and you want to upgrade it and start managing content with WordPress. You can find out what some of our clients from Digital Point forums think about our services via this link. 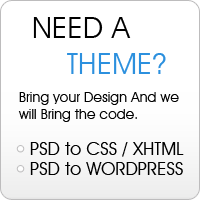 Fill in the form below to get a free quote for coding your theme. Please note: It is required that you include a screen shot of your design or a link to where we can see it.